This is a post that I wrote for Popblerd.com. Check them out for music, movies, sports, basically everything. Popblerd also started an around the league facebook page that I’m a part of so like the Roundball Soundoff Facebook page! 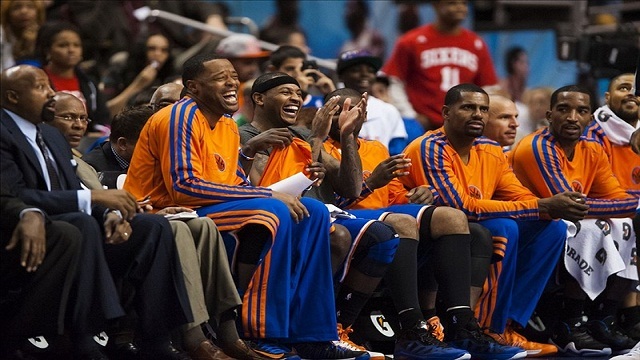 The NY Knicks are 4-0 for the first time since the 93-94 season. They are the only undefeated team in the NBA and played a lineup consisting of veterans Marcus Camby, Rasheed Wallace and Jason Kidd…in 2012. They are winning by an average of 17 points a game even though their opponents have a 13-2 record against other teams. I wouldn’t have believed any of these things would have happened if you’d told me a few weeks ago. Boston is having a harder with their new pieces than expected. They are 3-3, with 2 of their wins coming in the last few seconds of the game. On the bright side for the Celtics, Rajon Rondo just had his 30th straight game with at least 10 assists; 3rd all time to Magic Johnson – 44 and John Stockton – 37. The team many dubbed the best team in New York is 2-2 and have been wildly inconsistent, winning by 30 and losing by 20 in the same week. And in case you missed it, The Nets have a ridiculous mascot. The Timberwolves are 4-2 so far without Kevin Love and Ricky Rubio and looking more and more like they can break into the top 8 this season. One of those losses was to the Chicago Bulls and the game’s high scorer was Nate Robinson. It’s true. Andris Biedrins hit two free throws in a row on Saturday. This is of note because he does this on a regular basis. Also of note, Andrew Bogut managed to play 4 games in a row this season before getting injured. I picked the Detroit Pistons to finish 14th in the conference and it looks like I overrated them. They are 0-7 and losing by an average of over 11 points a game. The Oklahoma City Thunder shocked everyone by trading James Harden. They may not be as intimidating this season, but they are still a top 2 team in the west and have a ton of draft picks to look forward to. Speaking of James Harden, he was on fire the first 3 games he played for the Houston Rockets, proving he can be the number one option. The next 3 games proved you need a #2 option. Once teams locked in on him his numbers have dropped across the board…except for turnovers. They have a good foundation with Lin, Harden and Asik, but need another scorer before they become a playoff team. The Lakers are not the other top 2 team in the west. They fired their coach after 5 games even though 3 of them were without Steve Nash. Mike D’Antoni is their new coach. Should be interesting to see if he can keep the vets minutes down (something Brown wasn’t doing) with such a weak bench and considering he ran a few Knicks players like Lin and Stoudemire into the ground last season. Tim Duncan has turned back the clock and for the 6th straight year the San Antonio Spurs have made everyone who said they are done look foolish with a 6-1 start. The Portland Trailblazers may have one of the worst benches in history. Take a look at this if you don’t believe me. Who would you even call their 6th man? I picked the Denver Nuggets to come out of the west, but that was based on Danilo Gallinari being able to hit a shot. He’s shooting 30% from the field and 20% from 3 point land while taking the most shots on the team. What happened to the guy who could hit from anywhere on the court when he was on the Knicks? Danny Granger is out for up to 3 months with a knee injury which simultaneously bumps the Indiana Pacers out of the top 4 in the league and bumps my fantasy team out of the top 4 in my fantasy league. The unibrow is a beast already (his last game he had 23 points, 11 boards and 5 blocks) and is a difference maker on defense. The New Orleans Hornets already have 3 wins (something which will probably take Detroit until January to match). Too bad they gave a max contract to Eric Gordon who is out indefinitely. Who would have thought a guy who’s never been healthy….would continue to have health problems?